Super Savings Item! 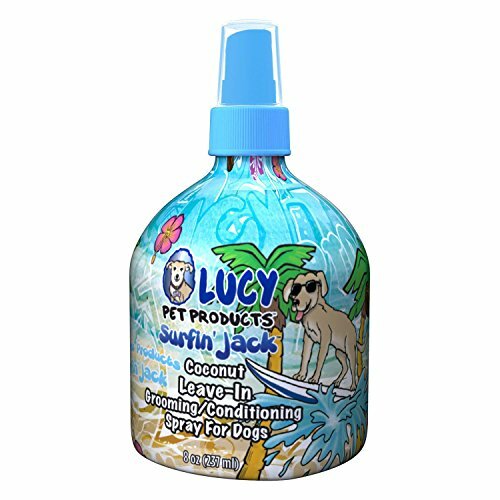 Save 35% on the Lucy Pet Surfin' Jack Moisturizing Coconut Leave in Conditioning Dogs Spray 8oz by Lucy Pet Products at Annie's Dog Spa. MPN: 1176.0. Hurry! Limited time offer. Offer valid only while supplies last. Have you ever had the desire for your pooch to smell so good you can't let them go? The wonderful people at Lucy Pet Products have heard your pleas! Have you ever had the desire for your pooch to smell so good you can't let them go? The wonderful people at Lucy Pet Products have heard your pleas! Introducing Lucy Coconut Dog Conditioner, a delightful leave-in grooming/conditioning spray for dogs. Made in the USA in sunny California, this amazing product will be sure to have your dog smelling like a tropical island FILLED with coconuts in no time. Lucy Pet Products do not contain parabens, sulfates, or harsh chemicals, and also adds shine and aids in untangling your dog's coat. You can also rest easy knowing that this product is natural and made with cruelty free products, and that part of the proceeds from this item go to the Lucy Pet Foundation. Yeah. That's right. Make your dog smell AWESOME and help a great cause? Sold. If you and your dog want to make every animal in your neighborhood jealous because you two smell good enough to lick, try Lucy Coconut Conditioning Spray. Ingredients: Surfin' JackTM Leave-in Conditioning Spray Ingredients: Water, Coconut and Vegetable Based conditioners, Cetrimonium Chloride, Chamomile Flower Extract and Papaya Fruit Extract (shine enhancers), Silk Amino Acids (hair detangler), Panthenol (hair strengthener), Hydrolyzed Whole Oats (moisturization), Tocopheryl Acetate (antioxidant), Polysorbate 20, safe and effective preservatives: (Phenoxyethanol, Caprylyl Glycol and Ethylhexyl glycerin), Fragrance. 8 oz. bottle of conditioning spray. If you have any questions about this product by Lucy Pet Products, contact us by completing and submitting the form below. If you are looking for a specif part number, please include it with your message.